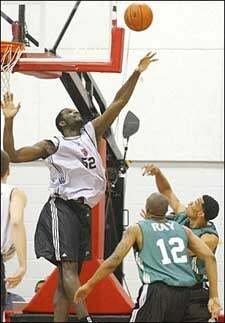 I knew there was an underlying reason notable tall dude Greg Oden went to the NBA after one year in college. It couldn't have been just the money, or the chance to be picked No. 1 overall. No, It had to be for the NBA rule that you foul out after six, not five like in college. Or maybe it was the all-too-enticing summer league, where you foul out after ten. Oden's 10 fouls came in only 20 minutes of game action with the Portland Trailblazers, while scoring just six points, getting two rebounds, and blocking two shots. To think, he was four points shy of the elusive points/fouls double-double. The Seattle Sonics' Kevin Durant, drafted No. 2, fared a little better. He scored 18 points, but only on 5-of-17 shooting. Worse still, he let his team down after the third quarter in that new controversial rule where you have to bench press as much as you can at midcourt, or your team loses 5 points.